1 of 1 Heat oven to 450 degrees F. Place a large rack over a baking sheet and coat with nonstick cooking spray. Set aside. 1 of 1 In a small bowl, stir together the wasabi powder and 1 tablespoon water. Whisk in sour cream, mayonnaise and scallion. Refrigerate. 1 of 1 Place potatoes on a baking sheet and toss with olive oil and salt. Bake at 450 degrees F. for 30 minutes or until tender, turning after 20 minutes. 1 of 2 Meanwhile, place flour in a shallow glass dish. In a second dish, whisk together egg whites and mustard. Place panko on a separate plate. 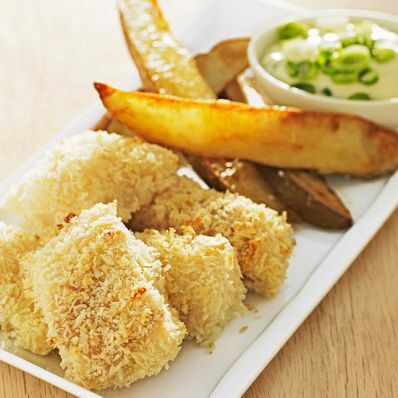 Coat cod with flour, dip in egg mixture and coat with panko. Place fish pieces on prepared baking rack. Add pan to oven after potatoes have baked for 15 minutes. Bake fish for 15 minutes. 2 of 2 Serve cod with potato wedges and wasabi sauce on the side. Per Serving: 12 g Fat, total, 48 g carb., 45 g pro., 478 kcal cal., 525 mg sodium, 2 g fiber, 4 g sat. fat, 98 mg chol.